The Eat-Clean Diet by Oxygen Magazine columnist Tosca Reno is based on her personal experiences with weight loss. Before she discovered how to ‘eat clean’ Reno was overweight at 200 pounds and lacking energy after giving birth to three children. She undertook an amazing transformation by changing her diet and lifestyle. Her approach was so successful that now she is an accomplished swimsuit model. Eating clean basically means that foods are selected from those in their natural state; unprocessed and whole. For example tomatoes are a clean food whereas ketchup is not. Homemade tomato sauce may be considered a clean food if it is prepared from scratch with all ‘clean’ ingredients. This is not necessarily a low calorie approach to dieting with a greater emphasis being placed on the quality of the foods selected, although Tosca does provide some suggestions to help with calorie control. Reno stresses the importance of eating a healthy breakfast every day and never skipping meals. She also encourages dieters to prepare for meals that must be eaten away from home by packing nutritious foods that travel well and by planning in advance. She recommends six small meals every day that are to be composed entirely of clean foods. Each meal should contain around 300-400 calories and must contain protein as well as complex carbohydrates. Cheat meals are allowed only once a week. This means that this is a very strict plan that will require a great deal of discipline in addition to implementing a dramatic overhaul of diet and lifestyle for most people. A wide range of fresh fruits and vegetables form the foundation of the diet. Complex carbohydrates include legumes as well as whole grains such as brown rice and oats. Lean proteins such as chicken breast, turkey and fish. Sources of healthy fats include olive oil, avocado and raw nuts. Foods to avoid include all processed foods, refined grains, sugar, foods containing saturated and trans fats and alcohol. Exercise is emphasized as being an essential part of any weight loss program and Reno advises readers to increase activity as much as possible as well as become involved in a weight training program for a minimum of 30 minutes on 3 days each week. She ascribes her own inspiring transformation to weight training to a large degree. These resistance exercises can be used with the Eat Clean Diet. 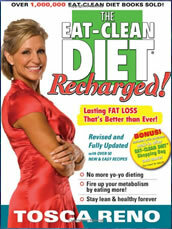 The Eat-Clean Recharged Diet book costs $16.95. Recommends a balanced intake of all food groups. Frequent meals spread over the day will prevent hunger while providing high quality nutrition at regular intervals. Emphasizes how eating whole unprocessed foods will make you feel better as well as improve your health and appearance. Emphasis in importance of adequate intake of essential fatty acids. Provides very good recipe and menu planning resources with estimates of preparation time for meals in addition to nutritional analysis. Will increase awareness of appropriate portion sizes. Reno’s personal story of transformation is very inspiring and will help readers feel motivated and encouraged to make changes in their own lives. Very stringent plan. Must give up all processed foods including refined carbohydrates, sugars, prepared foods and alcohol. May interfere with social interactions, as eating out can be extremely difficult without deviating from the plan. Recommends supplements that don’t have adequate scientific support of their effectiveness. On the whole this is probably one of the best plans available when considered from the perspective of the nutritional quality of the diet. However Reno’s advice to completely eliminate saturated fats is questionable as there is evidence to suggest that they have important roles to play in health. Eating clean requires tremendous discipline and may interfere with some aspects of the dieters lifestyle, but with careful planning it can certainly be achieved and it is probable that most dieters will be rewarded for their discipline. Weight loss is likely to follow eventually but results will probably be slower than many other diet plans due to the relative higher calorie intake on this diet. The benefits of this approach however are that weight loss is more likely to be sustained and health will be improved in the process. Just The Rules– Tosca’s new healthy eating quick guide. Reno, T. (2009). The EAT-CLEAN DIET Recharged! : Lasting FAT LOSS That’s Better Than Ever!. Robert Kennedy Publishing. Feeling great eating clean, so much energy and my skin is radiant. Lost 5 pounds the first eight days, and have yet to start exercising!!! Cant wait. Love her book, makes such simple sense.